The Skewb Diamond is an octahedron which is bisected 4 ways, by planes in between and parallel to two opposite faces. Any face can be turned through 120 degrees in either direction, moving exactly half the puzzle. The puzzle consists of 8 triangular face centre pieces and 6 corner pieces. 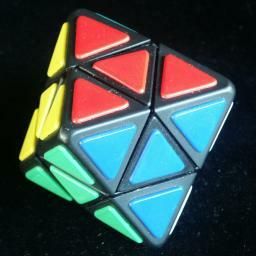 The Skewb Diamond is closely related to the Halpern-Meier Pyramid (see Pyraminx) and the Skewb, which also have 4 axes of rotation. The six corner pieces of the Diamond correspond to the 6 edge pieces of the pyramid. The 8 face pieces of the Diamond correspond to the corners and faces of the pyramid, except that on the Diamond none of the face orientations are visible. Similarly, the six corner pieces of the Diamond also correspond to the 6 face pieces of the Skewb except that orientations are visible, and the 8 face pieces of the Diamond correspond to the corners of the Skewb but without visible orientations. My solutions for the Skewb will also solve the Diamond. The solution below is slightly faster however. Note that turning one face has the same effect on the puzzle as turning the opposite face the other way. Therefore the puzzle can be solved by only using one of each pair of opposite faces. Internally 4 of the face centres are fixed on axes, and the other 4 are moving pieces. Externally there is no visible difference between the two sets. In the solution below we will use only one of these sets and call these the fixed face centres, and the other faces are called the free face centres. This internal mechanism not only makes clear that the two sets of face centres cannot be mixed together, it also shows the corners have only two orientations. This leaves 6!·4!·26/8 = 138,240 positions. This shows that any position can be solved in at most 10 moves (6.6921 on average). In Sloane's On-Line Encyclopedia of Integer Sequences this is included as sequence A079765. Uwe Mèffert's pages has a solution here. Mèffert produces and sells this puzzle, the Pyraminx, Megaminx, Skewb, and many others. Hold the Diamond with one face at the front with one corner pointing upwards. The set of 4 fixed faces that you will use in solving the puzzle lie on the down, left and right sides (adjacent to the front face) and the back side (opposite to the front). You will only turn these four faces, not the others, and the fixed centres of these faces show which colours these faces should have. Denote 120 degree clockwise turns of the faces by L, R, D and B. Anti-clockwise turns are denoted L', R', D' and B'. Any corner can be specified by two letters, e.g. DR is the corner where the down and right faces meet. The 4 free face centres can similarly be specified by 3 letters. Phase 1: Place the three top corners correctly. Find a corner piece in the D layer which belongs in the top layer. If there are no such pieces, then choose any corner in the D layer to use to displace an incorrectly placed corner from the top layer. Rotate the whole puzzle so that the corner piece belongs (or is to displace the corner piece) at the LR position (the top front corner). Turn D to put the corner piece at the back (at DB). 1. To move DB to LR, do R'D'R. 2. To move DB to RL, do LDL'. If you choose the wrong one, you can use R'BD'RL' to flip the LR position in place. This is also useful if in step a you only have flipped corners in the top layer. Phase 2: Place the other three corners correctly. Rotate D to put its corners in position, though they may have the wrong orientation. If some corners in the D layer need to be twisted around, turn the puzzle around the D axis so that the corners to be twisted lie at the front of the puzzle (at DR, DL to be precise). Then do DL'BRB'L. The corners should now be correct. Phase 3: Place the free face centres correctly. If one of the face centres is already correctly positioned, then hold the Diamond so that the correct centre lies in the top face. The other three centres need to be cycled around, and this is done by performing the sequence LR'L'R'LR'L'R' to move them anti-clockwise around D, or RLRL'RLRL' to move them clockwise. If none of the free face centres are correct then hold the diamond so that the top and front centres need to be swapped around and do RDRDRB'L'B'L'B'.